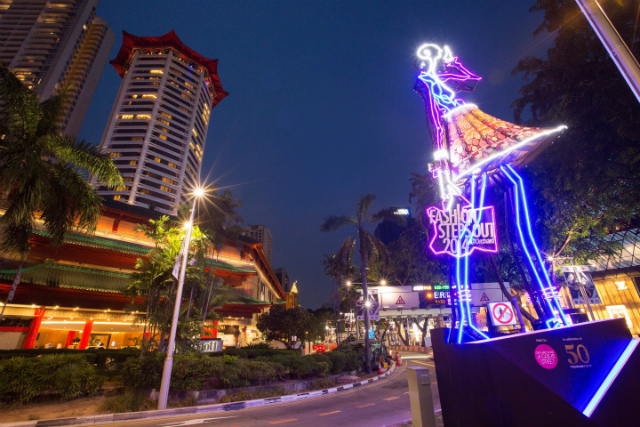 Orchard Road will be transformed into a fashion runway for one night only, on April 5, 2014. We're all used to shopping at the glitzy malls on Orchard Road, but it's not everyday that you'll get to see a fashion runway show, on the actual asphalt road itself. 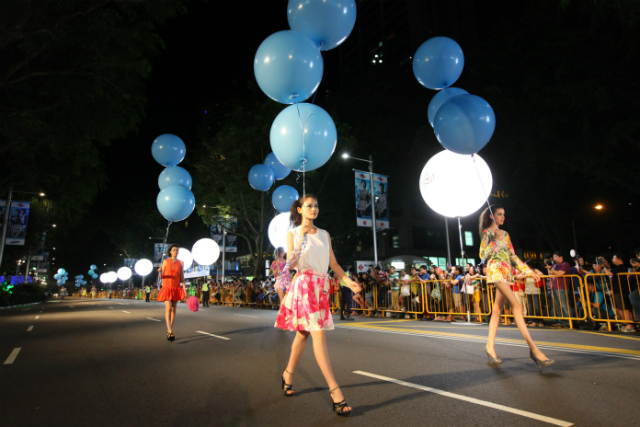 On April 5, 2014 at 8.30pm, the annual Fashion Steps Out @ Orchard (FSO) will kick off with its traffic-stopping Orchard Fashion Runway show for a night of runway revelry on the famed shopping stretch. Models on the Orchard Road runway for Fashion Steps Out 2013. For one night only this Saturday, traffic on Orchard Road will be closed off to transform the entire stretch into the site of a fashion runway show. Instead of fast cars zipping past, you'll see runway models strut their stuff down Orchard Road. As many as 150 models will make the long walk for FSO 2014. They'll be decked in Aimer beachwear, Ashley Isham gowns, stylish threads from the Robinsons department store, as well as Singapore fashion brands Depression, The Reckless Shop and more participating retailers located along the Orchard Road stretch. Aimer beachwear, one of the looks seen at the Fashion Steps Out @ Orchard Road media preview. The April 5 event marks the start of six weeks' worth of fashion festivities for FSO, which is back for its fifth year since its inception in 2010. Don’t miss out on shopping discounts, voucher giveaways and more fab shopping events to come for FSO 2014. Event highlights include the Local Labels Exhibit @ Orchard Central, a showcase held in support of emerging Singapore fashion designers; see it at the Orchard Central mall from now ‘til April 11. So be there, to see the stunning transformation of Orchard Road; trust us, it’ll definitely be an oh-so Instagrammable moment. Fashion Steps Out @ Orchard 2014 will run from April 4 to May 18, 2014. For more information, visit www.orchardroad.org and check out the Orchard Road Facebook page.